I’ve hated ghost stories, horror movies and all things even remotely scary since I was nine years old and read a book of ghost stories from my school library, so I’m at a loss to explain why I thought it was a good idea to start swapping first‐ and second‐hand ghost stories when I was having lunch with a friend a week ago. That was all fine and good on a sunny Saturday afternoon, sitting in her bright, cozy kitchen in the County Kildare countryside with a glass of wine, but a few nights later, up in the middle of the night with my little boy, all our stories were running through my head and I was scaring myself silly. But I’d do it all over again just to have this lunch that she made (not to mention her warm Bakewell tart with fresh raspberries, but that’s a recipe for another day). The fact that I made it myself for my family just one week after having it for our girls’ lunch will also tell you something about how good it is. My four‐year‐old daughter liked it so much on Saturday that she was disappointed when I served up something else on Sunday and said she wanted this again. Lucky for her, there were leftovers that I’d been planning on having for lunch yesterday, but I let her have them for dinner last night instead. Such are the sacrifices we make for our children — including getting up in the dark to soothe them back to sleep when you’ve turned into a scaredy cat again and just want to pull the covers over your head. Don’t let the long list of ingredients put you off, it’s just a bunch of spices, and the marinade takes all of 5 minutes to put together. As an alternative to the raita, you could make a mango salsa by combining 1 large mango, peeled and chopped, 1 red chili, deseeded and chopped, the juice of 1 lime and 1 tablespoon chopped mint. This tandoori chicken is very similar to Kelly’s chicken tikka masala, the main difference being that this version has more spices and doesn’t have a sauce, which makes it even faster and easier to cook as a weeknight dinner. I served it with the pan‐roasted curried cauliflower and peas from that menu, as well as Kelly’s cucumber raita, which I added a large handful of chopped fresh mint to. I cooked the curried cauliflower in a separate pan, but next time I’ll try increasing the amount of spices for the Bombay potatoes and just cooking all the vegetables together in one pot instead. Combine all the marinade ingredients (except the chicken) in a medium‐sized bowl. Add in the chicken, making sure all the pieces are coated with the marinade. Cover the bowl with cling film and marinate the chicken breasts overnight in the fridge. To cook, preheat the oven to 400°F (200°C). Place the potatoes in a saucepan with cold water, bring to the boil and drain immediately. Meanwhile, heat a frying pan with 2 tablespoons sunflower oil. Seal the chicken breasts for 2 or 3 minutes per side, then transfer to a baking tray or casserole dish and cook in the preheated oven for 25 minutes. In another saucepan, heat 1 tablespoon sunflower oil over a medium heat and fry the onions for 10 minutes, until translucent. Add the tomato puree, curry powder and salt and pepper. Cook for 1 minute, stirring with a wooden spoon. Add the parboiled potatoes and stock. Cover and cook for 10 minutes, until the potatoes are tender. Add the baby spinach just before serving, stirring until the spinach just wilts. 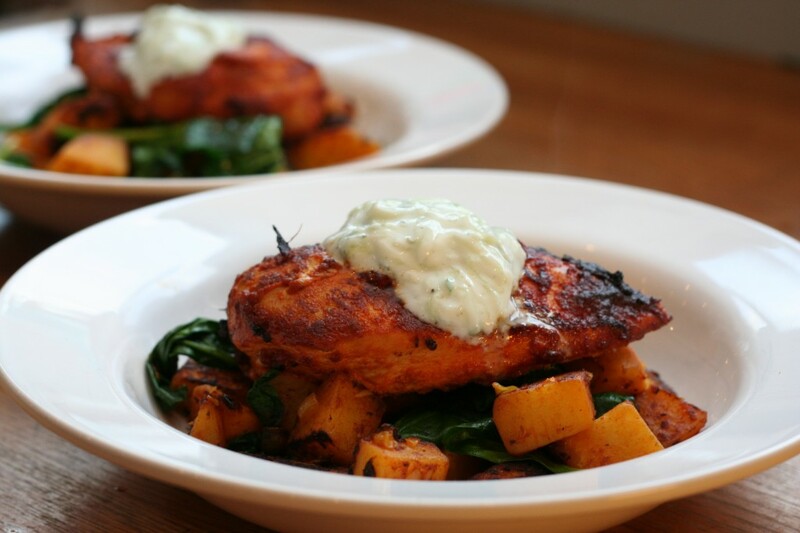 Serve the chicken on top of the potatoes and spinach, garnished with a dollop of cucumber raita.